And You Call Yourself a Scientist! A mad scientist on mad scientists. Master the scale of the universe -- with thanks to Jon Carroll for the tip. Country Joe will be doing a very limited few performances this year of the 50th anniversary of the Woodstock Music Festival. But he is declining all requests for interviews. For licensing and permissions requests, and for all other business stuff, please contact Bill Belmont. A short bio for PR. Listen to some background music while you surf. We are currently offering my album Carry On. We recommend VLC Media Player to listen to these files. Watch a light show while you listen. I will gladly hand-sign anything you send if you include a check for $20 US made out to Joe McDonald. You are responsible for the packaging and the postage, both to me and the return packaging and posting. Send to: Country Joe McDonald, P.O. Box 7064, Berkeley, California 94707-0158. ... or Bullfrog Blues Radio from Portsmouth, England. elcome to my home on the web. I'm a singer and songwriter, I used to be in Country Joe & the Fish, and I live in Berkeley, California, Planet Earth. Get info on my upcoming gigs and booking. My new CD titled simply 50 is out. Preview the songs, notes, and musicians, and order your copy from the Country Store. Read a review. And another review. Craft Recordings has announced The Wave of Electrical Sound deluxe vinyl box set, celebrating the groundbreaking music of Country Joe and the Fish. 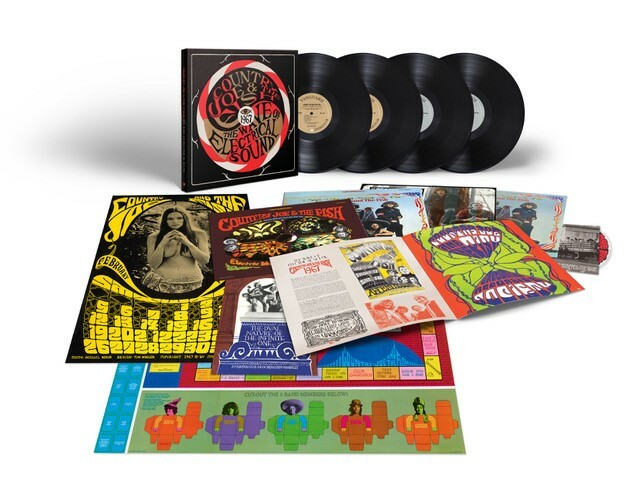 The limited-edition, 4-LP box set offers both mono and stereo versions of Electric Music for the Mind and Body and I-Feel-Like-I’m-Fixin’-To-Die, pressed on 180-gram vinyl, plus replicas of The Fish Game, a Fish Fan Club book and a Fish calendar; a 30-minute documentary and a 24-page book, featuring rare photos, artwork and new liner notes. Here's the package. You can order your copy here. Read about my "farewell performance" from the San Francisco Chronicle. I'll be playing at Woodstock 50 this August. Learn about the Woodstock 50th anniversary events getting underway. PBS stations this March are showing an all-star Woody Guthrie tribute from 1970 -- and it's never been seen before! It's got Pete Seeger, Arlo, Joan Baez, me, and more. See a preview. The show will be out on DVD in June. Bill Steele, one of my partners in the Berkeley String Quartet, has died. Bill has his own site at billsteelesongs.com. The New York Times has an opinion piece about music and the Vietnam war. I put on a show at the San Francisco County Jail for Heroes' Voices, an organization that does music and poetry events for inmate veterans. Check it out. San Francisco Chronicle columnist Kevin Fisher-Paulson was there and gives this account. At last proof that I improved the health of my generation: The Case for Cursing. Politics got you down? This is sure to make you smile (it's the real thing). The UCSF School of Nursing is planning to archive my Tribute to Florence Nightingale website so that its information will be saved for posterity. (But the site will still be available in its current location.) They are also taking over my collection of Nightingale memorabilia. Read an interview with me by the UCSF archivist. Glass sculptor Peggy Pettigrew Stewart is casting the faces of many Woodstock musicians, including mine, to be reproduced in glass. We're going to be posting pictures of the process here as it goes along. My son Devin has bought Berkeley's beloved Mr. Mopps' toy store. You can visit Mr. Mopps' on the web and on Facebook. Listen to her address the AA. Read a short story by Joyce Renwick. "Janis" from Danish TV in 1968. A half-hour set from German TV in 1969. A full set from the All Star Band at Winterland in 1973. My new song "Support the Troops." "Rock and Roll Again" outside the Melody Tent in Cape Cod, 2007. ...or listen to fan tapes of my live shows from the Internet Archive. "I-Feel-Like-I'm-Fixin'-to-Die Rag" -- everything you want to know about the song and much, much more! The story of the notorious Fish Cheer. Hear some early recordings of my old group, the Berkeley String Quartet. My earliest musical collaborator was Blair Hardman, and we recorded an album in '65, The Goodbye Blues. Listen to Country Joe In Space, a virtual compilation of my science-fiction oriented songs. Available only in cyberspace! Looking for a particular CD? Here's the scoop on all the titles. Amazing stories that folks have sent me. "Country Joe collects dolls!?" Yeah, what's it to ya? See my nurse doll collection. The attic, where we store old junk.